Who can resist a product that looks like sago pudding? Not me! I admit that I’m not much of a one for facial primers, but, as I am a big fan of Guerlain’s Lingerie de Peau foundation, I thought I’m give their primer a try too. 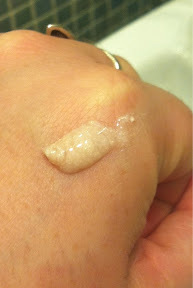 Mainly, admittedly, because it is by far the prettiest primer on the market. You can see how it reflects light already. My favourite way to use this is to mix equal amounts of primer with my foundation (and I use it with all my foundations) then “slip, slap, splosh” it all over my face with my fingers. I’m too lazy in the mornings to bother putting on a layer of moisturiser, a layer of primer and a layer of foundation, so I skip a step. I find that mixing the foundation with the primer gives the foundation a more “moussey” or airy texture, and also thins out the foundation a little, giving a slightly sheerer finish, also the primer allows the foundation not to gather in pores as a result. This won’t give you as “flawless” a finish as a silicone primer, but I do find it makes my foundation last a little longer through the day, but, that being said, I wouldn’t class this – or indeed any – facial primer as a necessity. I’ve never found a single one that does what it says. Ever. 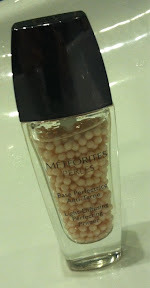 In essence, the Guerlain Meteorites Primer is nice to have, lovely to look at, and fun to use, but is it an essential? No. I just found your blog….its AWESOME!!! I just started blogging and hope to eventually have something like yours and a lipstick collection like yours as well! Glad I found it!